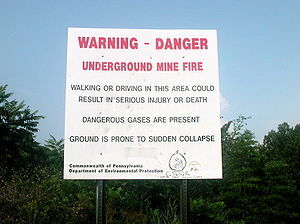 One of the locations for my next book, tentatively titled Centralia, is a small town in Pennsylvania by the same name. It is (or was) a coal mining town . . . until a fire destroyed it in 1962. But this wasn’t your typical fire. It didn’t consume homes and destroy buildings. It ate away at the town from beneath, from within the coal veins that run beneath the surface. And after 51 years it’s still burning. You can read more about the town and the fire and see some excellent photos here. Next Saturday I hope to visit Centralia . . . or what ‘s left of it. Most of it has been razed and all but 10 of the residents have left. Oh, but in this story Centralia is so much more than just a town, it’s . . . well, you’ll just have to wait and see. Posted on August 15, 2013, in Centralia and tagged Centralia, Centralia Pennsylvania, Coal, Coal mining, Mining community, Pennsylvania. Bookmark the permalink. 5 Comments. I am looking forward to this. Back when I first heard you mention Centralia, my first thought was that there are a lot of unexplored story possibilities that could be written about that town. The story of Centralia is a fascinating one. It is a great idea to set your next book there. I have visited Centralia via Google Earth, lol. It is really spooky. I’m looking forward to your book. Oh, I can’t wait! Sounds like it will be an amazing book! Will have to check out that link on the town, I’ve never heard of this happening before. Let’s see… it’s the direct inspiration for Silent Hill and was a locale in Tim Downs’ book Chop Shop. If that’s the main place your book is gonna be in, I’m all in!